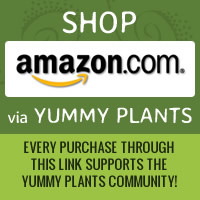 Thank you to Ellen Jaffe Jones, author of Eat Vegan on $4 a Day, for sharing this recipe with the Yummy Plants community! Ellen is committed to creating healthy dishes that are super yummy and affordable. This recipe isn’t in her book; Ellen created it just for us! Learn more about being vegan on a budget from her blog: The Veg Coach or chat with her directly on her Facebook page. 1. In a large skillet, dissolve and stir the water and Vegebase. 2. Add the beets, cook over medium heat for about 10 minutes until the greens are wilted and still green, and the beets are soft. Add more water to keep the vegetables from sticking. Some people like to add a touch of oil during cooking to prevent sticking. Add the optional garlic powder before serving. Tip: You can cut the beets any way you want. But the contrasting colors show up beautifully when the beets are thinly shredded or sliced. The smaller the pieces, the quicker they cook. 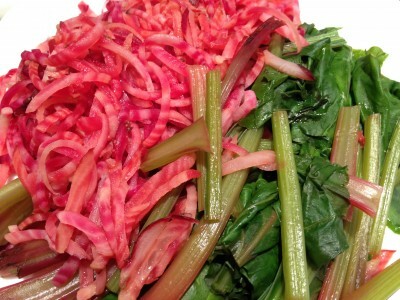 Let us know what you think of this easy vegan recipe: Beet These Greens for Price!